When Rocky Batolbatol directed his career path to ONE Championship nearly three years ago, he was once touted as a promising Filipino talent from the beautiful city of Bacolod in the Philippine province of Negros Occidental. However, the luster of his billing as a top-notch prospect slowly faded when a string of setbacks came his way. The 31-year-old Bacolod City native suffered a second-round submission loss at the hands of Aussie standout Martin Nguyen in his November 2014 promotional debut. 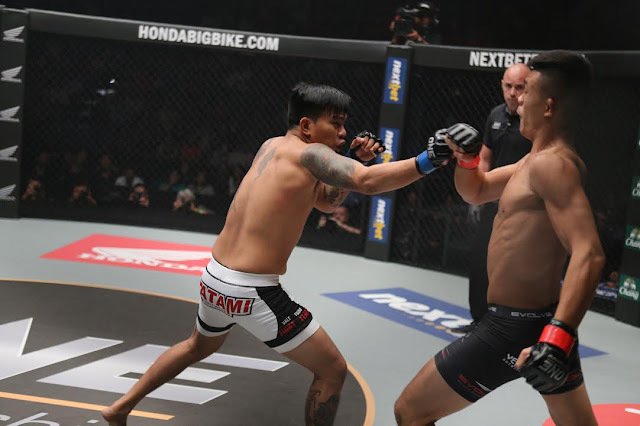 Batolbatol encountered the same fate in his second ONE Championship outing as he tasted a first-round submission defeat to Dutch-Indonesian journeyman Anthony “Archangel” Engelen in February 2016. A victory under the ONE Championship umbrella remained elusive for Batolbatol as he yielded to up-and-coming Singaporean martial arts superstar Christian Lee via first-round technical knockout in May 2016. Determined to break his three-match losing skid in Asia's largest mixed martial arts (MMA) organization, Batolbatol makes his return to action by squaring off with Indonesian combatant “The Terminator” Sunoto on ONE Championship’s inaugural card in Surabaya, Indonesia. “I am back! I am so excited to be back in action for ONE Championship, the Asian leader of martial arts and the premier MMA promotion in the region. Ever since my last fight, I did not stop training. It is truly an honor to showcase my talent and skills on a global stage like ONE Championship,” Batolbatol expressed. Both men are set to collide on the undercard of ONE: CONQUEST OF KINGS, which takes place at the GOR Kertajaya Arena in the Indonesian capital of East Java on 29 July. With the ambition to insert his name into the winner's column and regain his reputation as one of the Philippines’ best bantamweight fighters, Batolbatol bared that he put more emphasis on the grappling department in training camp as his cage counterpart has a penchant for grappling. “I wanted to be comfortable anywhere the fight would go. That is why I focused on my wrestling and Brazilian Jiu-Jitsu for this fight. But of course, I did not neglect my striking, which is my bread-and-butter for years,” he confided. Batolbatol is former professional boxer who has transitioned smoothly into the sport of MMA, winning his initial five bouts in spectacular fashion. Constantly utilizing well-placed combinations in search of spectacular knockouts, Batolbatol will be looking for a stoppage against a gritty opponent like Sunoto. “I want a knockout. It has been a longtime since the last time that I won by way of knockout. I am going in that cage with a statement to make. I can truly say that I am in the best shape of my career,” he said. Batolbatol stressed that he finds himself in a must-win situation against Sunoto, who seeks to make it two in a row in 2017 following his first-round demolition of Cambodian stalwart Chan Heng this past January. “I need this win. I can’t lose forever. It feels like I’ve been losing forever already. But this is my chance to prove that there is a light at the end of tunnel. No one stays on the losing side,” he stated. According to Batolbatol, losing is part of the sport. Even though winning has shied away from him in his last three fights in ONE Championship, he explained that his love for MMA keeps on luring him back. “I am continuing my career as an MMA fighter because I love this sport. It keeps me alive. Moreover, this is what I live for. Setbacks don’t matter because I love what I do. That’s why I do it,” he shared. As he shares the ONE Championship cage with Sunoto on 29 July, Batolbatol remains optimistic that he will have his raised in triumph for the first time at ONE: CONQUEST OF KINGS. “I am motivated to win this fight. I want to secure my first win in ONE Championship. That’s my goal. It keeps me focused and driven for this fight,” he ended.